From, LiveScience.com : During a field expedition to Ethiopia, a team of scientists noticed something odd: The golden jackals there looked more slender with a whiter coat than they do elsewhere. Now, genetic analyses suggest these oddities are not jackals at all but instead more closely related to gray wolves. In fact, until now these “highland jackals” were referred to as Egyptian jackals (Canis aureus lupaster), and had long been considered a rare subspecies to the golden jackal (C. aureus). “It seems as if the Egyptian jackal is urgently set for a name change,” said study researcher Claudio Sillero of Oxford University’s Wildlife Conservation Research Unit (WildCRU). “And its unique status as the only member of the gray wolf complex in Africa suggests that it should be re-named ‘the African wolf,’” said Sillero, who has worked in Ethiopia for more than two decades. “We originally set out to study the jackals in Northern Ethiopia, and discovered this new species by chance through the genetic analyses,” said study team member Nils Christian Stenseth, a research professor and chairman of the Center for Ecological and Evolutionary Synthesis at the University of Oslo in Norway. “Our findings suggest that the colonization of Africa by the ancestral stock of gray wolves took place about 3 million years ago and is today embodied in the animal that has hitherto been called the Egyptian jackal,” Stenseth told LiveScience. 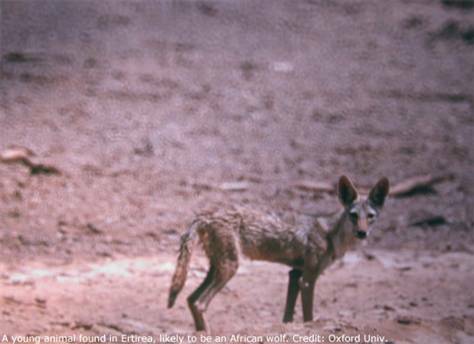 “A wolf in Africa is not only important conservation news, but raises fascinating biological questions about how the new African wolf evolved and lived alongside not only the real golden jackals but also the vanishingly rare Ethiopian wolf, which is a very different species with which the new discovery should not be confused,” said study team member David Macdonald, director of Oxford University’s WildCRU. Currently, the golden jackal is listed as a species of least concern by the International Union for Conservation of Nature (IUCN), which means the animal doesn’t fit into any of the “endangered” or “threatened” categories. “In Ethiopia, the golden jackals, which presently includes the cryptic African wolves, are systematically persecuted because of their threat to livestock,” the researchers write. Even so and even though the Egyptian jackal is supposedly extremely rare, it is not protected, they add. To get an idea of the true population numbers and distribution, the team said a thorough survey is needed in both Ethiopia and adjacent countries. Stenseth and his colleagues hope to continue their research with a study of the animal’s ecology – how it interacts with other animals and its environment.